The world demand for faster, more energy-efficient information processing is growing exponentially. To answer this demand researchers are looking beyond conventional digital processing to brain-like models, where massively connected networks of artificial neurons and synapses process information with extremely high energy efficiency. These new information processing paradigms require new functionality from devices, as well as new architectures and algorithms. New functionality requirements in turn drive the development of novel devices. This program is aimed at developing the necessary device-level and circuit-level measurements and theory to support the evolution of this technology from laboratory research to commercial application. As we move into the third decade of the 21st century, information processing is becoming more and more ubiquitous and demanding, with applications ranging from searching massive databases to local interpretation of sensor data on a wide variety of devices in the Internet of Things. Software-based artificial intelligence is already making great strides in answering these demands, but because it is based on conventional digital CMOS logic, it is inherently energy-inefficient. Large scale computers today can rival the human mind at tasks such as playing “go”, but only with power consumption four orders of magnitude larger than the 20 watts used by the human brain. The fact that the human brain can perform these tasks clearly demonstrates that it should be possible to greatly reduce the energy consumption involved in information processing. To reach this goal, however, requires moving away from traditional digital logic. A promising approach involves developing new, low power devices, architectures and algorithms that mimic more directly in hardware the systems of neurons and synapses in the brain. In support of this new research, we are developing measurement, fabrication and theoretical capabilities in the CNST to enable users to benchmark devices, measure circuit behavior, and understand the physical models necessary to engineer these new systems. One type of device that is emerging as an attractive artificial synapse is the resistive switch, or memristor. These devices, which usually consist of a thin layer of oxide between two electrodes, have conductivity that depends on their history of applied voltage, and thus have highly nonlinear, hysteretic I-V curves. 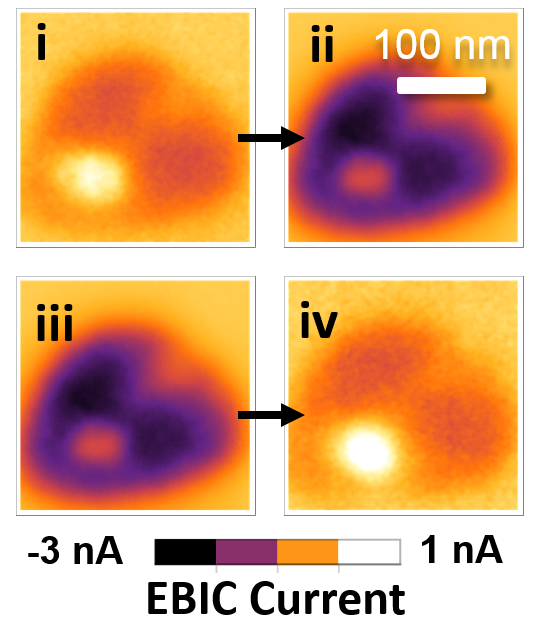 The underlying mechanisms that cause this behavior are not well understood, but are largely thought to be related to the formation of a nanoscale filament of vacancies or other dopants. EBIC image of an on (i) to off (ii) and off(iii) to on (iv) transition in a TiOx memristor. We are developing measurement tools to investigate the switching processes in memristors based on a range of imaging tools. For example, we use electron-beam induced current (EBIC) in a field-emission scanning electron microscope (FESEM) to obtain high resolution images of switching filaments, and also explore the origin of the conductivity as a function of memristor state by varying the impact energy, which allows us to probe the depth dependence of the EBIC current. We are also employing scanning thermal microscopy to image the local heat distribution in actively switched devices to elucidate the filament formation process. Another device with potentially useful functionality for neuromorphic computing is the magnetic tunnel junction. These devices are already being incorporated into integrated circuits to provide non-volatile memory. A straight-forward application is then to use them to store synaptic weights locally, removing the energy cost of transferring them from remote memory. However, using the same device stack but varying the geometry allows these devices to become compact oscillators to become stochastic superparamagnetic devices. Building on our expertise in spintronics, we are investigating computational schemes based on these different functionalities where a single device can play roles that would require tens of transistors. We are developing ways to couple these devices and to characterize their coupled behavior. Neuromorphic circuit evolution is critically dependent on developing robust fabrication methods for the complex oxides and other exotic materials that form the artificial synapses and neurons. Moreover, these devices must interface with conventional electronics in order to get information into and out of them. We are developing processes in the CNST NanoFab to streamline material growth of relevant materials, and are also working toward establishing a CMOS-based test b ed, where standard foundry-made CMOS circuitry with multiple diagnostic sub-circuits can easily be integrated with neuromorphic devices in a variety of interconnection topologies. As neuromorphic circuits become more complex with increasing number of devices, it will become impractical to measure the activity of each individual device. To address this we are also developing large-area imaging methods to observe patterns of activity in neuromorphic circuits. When the number of devices and interconnections becomes large enough, these methods will allow observation of the collective, nonlinear, oscillatory and sub-chaotic behavior that will constitute near-brain-like activity. To support our efforts to develop measurement and fabrication tools for CNST users, we are actively pursuing theoretical modeling of a range of neuromorphic devices and architectures. As these and other neuromorphic approaches evolve, we will continue to provide modeling and theoretical understanding of new schemes, and provide understanding of measurement results. 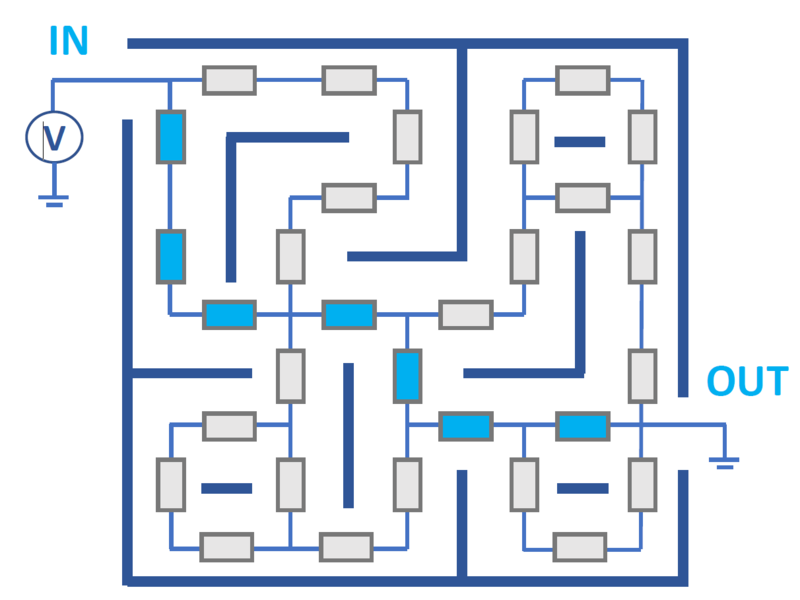 A maze is formed by a network of memristors. When applying voltage of at the entrance and exit of the maze, the conductances of the memristors will evolve. The memristors forming the shortest path will eventually have a high conductance (light blue rectangles) while the others will have a low conductance (grey rectangles). Neuromorphic computing with nanoscale spintronic oscillators, J. Torrejon, M. Riou, F. A. Araujo, S. Tsunegi, G. Khalsa, D. Querlioz, P. Bortolotti, V. Cros, K. Yakushiji, A. Fukushima, H. Kubota, S. Yuasa, M. D. Stiles, and J. Grollier, Nature 547, 428–431 (2017). Stateful characterization of resistive switching TiO­2 with electron beam induced currents, B. D. Hoskins, G. C. Adam, E. Strelcov, N. Zhitenev, A. Kolmakov, D. B. Strukov, and J. J. McClelland, Nature Communications 8, 1972 (2017).